Wow Stephen! You really care for your clients! Your service has been the best that I have encountered in an on-line situation. This causes Cable Chick to stand out from the "the rest" and in addition, you with it. Acheive longer length S-Video connections with this handy S-Video Coupler / Joiner! S-Video was a beloved, but often overlooked, connection standard which filled the quality gap between the ordinary Composite Video RCA standard, and the high end separation of RGB Component Video. Retro console gamers in particular will love the added quality of S-Video over Composite video, which trying to get the best picture out of some classic video game consoles. but of course S-Video's applications stretch well into home theatre, and many early camcorders. Don't forget to check out our similar Composite Video (Male) to S-Video (Female) adapter or Composite Video (Female) S-Video (Female) Adaptor should you need adapter a Composite Video socket for S-Video duties, or vica-versa. Just wanted to say thank you. I ordered a High-end SCART to 3RCA + S-Video Adaptor with Direction Switch to sort out my Foxtel recording to a video player and it is just what I needed. 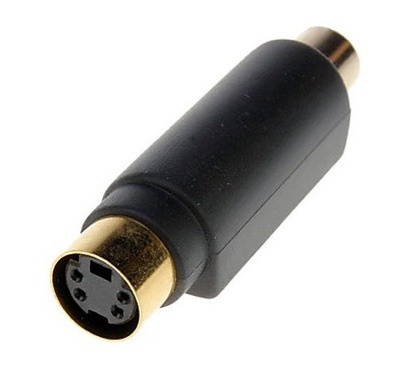 When I was checking out your site I was not sure what I was looking for, but your site is very easy to use and it took me no time to discover the adaptor. What is really impressive is the delivery time, I ordered it on friday and it arrived on monday and I live in a remote mining town in Western Australia. Normal it is about 5 days for delivery from the eastern states.